Notary forums are an excellent source of opinions about a wide variety of companies. 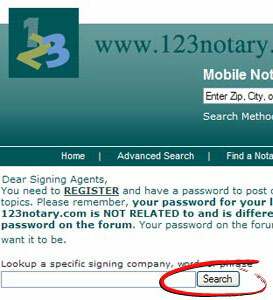 http://www.123notary.com/forum.htm has vast information about many signing companies. The forum on notary rotary is also excellent and is another source to check. The other forums for notaries are not frequently used and not worth checking. 5. Keep the faxed work order in your file. You need to keep all work orders as they are the proof that a job was assigned to you. You should mark the date in which the job gets done at the top of the work order and file the papers in order of the date that your notary journal records the date of the notary work. Keep a record of the second half of the company check that you tear off. It will have the check number and the jobs that were associated with that check. Companies will say they paid you for a particular job on a particular check. If you don't save ALL stubs, you will not know if they are cheating you or not. Many companies depend on notaries to keep bad records in order to rip them off. Don't let that happen to you! Keep all check stubs in a file, and keep a log book of who paid you with which check number and when you received the check. 7. Keep a thorough log book. Keep a log book on a computer or on paper. Since computers crash from time to time, paper is safer. Keep track of who assigned you what job, when, when the job was done, and have another column for check marks and the date and CHECK # used when you got paid. You have to keep careful records. Your log book should be sectioned off with a different section or page for each company so you can keep everything straight. (d) Date the signing took place. 9. The Demand For Payment Letter. Here is a letter you can send companies who didn't pay you for (60) or more days. (Here you need to state a brief recap of the previous communications that were sent and the result of that communication). a. Notify the Attorney General of of the details and circumstances of the occurrence. c. Notify other notaries public of the details of non-payment. e. Register the details of the occurrence with the BBB. And then you need to enter your mailing address. The date used was (5) days from the date of the email/letter. You need to send this by certified mail as well as to email and fax it over every day so as to annoy them. Also, cc: an attorney at the bottom of the letter. If you don't have one just find one out of the phone book. Also fax this over periodically to the companies that owe you. You can scan it and email it as well. If all else fails, the collection company can collect for you. If you live in the same state as the company that didn't pay you, it is easier to pursue legal action. Please consult an attorney who is willing to help you. Small claims court may be the easiest, but let the attorney give you his or her recommendation since they are authorized to give that sort of advice. The forum on 123notary.com has a whole section about getting paid. You can read through the "Getting Paid Archives"
and find opinions of notaries who have dealt with this issue. (a) How fast do I get paid? or, how long after the loan closes do I get paid? (b) What if the loan doesn't close due to the lender's error, or bad luck? Do I still get paid? And how soon? (c) What if the borrower is not happy with some terms in the loan documents and won't sign some or all of the documents? Do I get paid a partial payment? (d) What if I go to the borrower's house and they are not there. I wait half an hour and nobody shows up. I call the borrower repeatedly, and call the lender and the company that assigned me the job. Do I get paid? (e) What if the job is cancelled after I am more than halfway there? (f) What if I use my printer to print three-hundred pages of documents for the loan and THEN, they cancel. (g) What if the notary makes a mistake? What is the procedure? So much trouble just to get them to call me back!!! The only time I ever got a phone call returned from Joanna in accounts payable at XYZ company was when I left my phone number only with a message that I owed XYZ company money and didn't know where to send it, or to whom to direct it. The lady was slightly irate when I told her that was just a ploy to get my call returned, and here's what we need to talk about...............to no avail, of course. At least I got a lick in before she dumped me. I read on another forum that a notary signing agent contacted the FBI about a company that hired him to do a signing and didn't pay him. They said it would be considered internet fraud because the company solicited him to do notarizations with no intention of paying for them. That all I've heard about it so far. I don't know if he was actually able to file the complaint or not, but I like the idea. I think it should be considered fraud. I hope it works for him. It would sure open up a whole new way to make sure we get paid and make these deadbeat companies think twice before cheating us. Here's another thought. I was also going to call my county courthouse. I wanted see if my notarizations that weren't paid for would still be considered "legally binding". I don't know if that would be a good idea or not. By law we are required to charge a certain fee so if we're unable to collect it, would that nullify them in any way? If you went to the DMV to get your car title notarized and then refused to pay for it, you sure wouldn't get your title processed. It shouldn't be any different for a mortgage. I was speaking with another fellow notary the other day and she shared with me a fantastic idea she and a few others are doing to help insure payment from companies in the event the borrowers cancels, etc. The idea is to have a document that the borrower would sign at the time of closing that states that if the loan doesn't go through for any reason then they are responsible for payment of all notary fees. Now I don't know if this violates any RESPA laws or any other law, but, it seems to me that if the appraiser can get paid then we should be able to as well. We are both subcontractors. And we all know the appraiser always get his/her money regardless to the outcome of the closing. What do you guys think about this? Raising the heat and making signing companies uncomfortable is the best way to get paid. A letter from an attorney is one way to raise the heat. Signing companies do not want legal problems. A letter from an attorney can be very intimidating. The letter does not guarantee that you will get paid, but you will leave a lasting impression and will increase your chances of getting paid. If you actually need to take a company to court, you might need an attorney who is in the state where the company's office is. So, if a company in Illinois hires you to do a number of signings, and doesn't pay you, you will need to discuss that with an Illinois attorney. Roughly 35% of signing companies are located in California, but the rest are scattered across the country.